This past week, there as been a lot of talk about Google’s new browser Chrome. It’s definitely not a Firefox or IE killer but I don’t think it’s meant to be. My thoughts are that Google didn’t like how their apps performed within IE and Firefox and therefore introduced Chrome as a blueprint for the other browsers to follow. I would say it’s a challenge of sorts to the big 2 browsers. 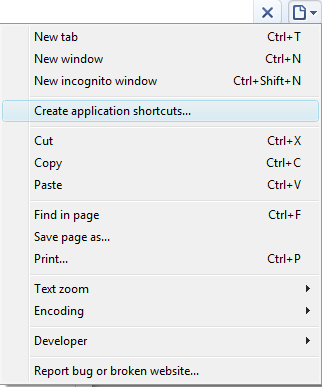 Time will tell if I’m correct but one feature of Chrome that I love and hope IE and Firefox adopts is the application shortcuts feature. I can now have a link on my desktop or quick launch toolbar to my favorite web apps, like Adsense, Analytics and Gmail. Within Chrome, go to the site that will be a new shortcut. Click on the “Control Current Page” button on the upper right had corner. Choose what kind of shortcut and click on the ‘OK’ button. There has been a site or two that I haven’t been able to create a shortcut for. I tried to create one on rockymountainnews.com and it would not continue. Is there something about certain sites that Chrome won’t respond to or is it the site? What is your favorite Chrome features and/or what don’t you like about Chrome.